It’s cold here in Detroit. Damn cold. A “polar vortex!” The kind of brutal cold that makes you want to curl up by the fire with a good book or, in the case of my wife, all six seasons of Breaking Bad. At once. Yikes. 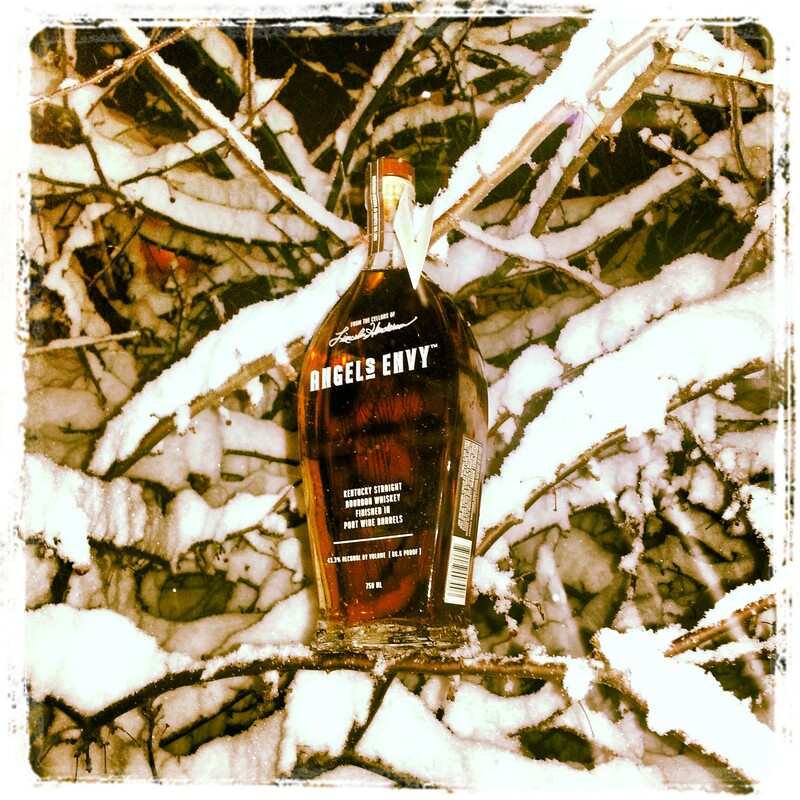 Personally, I prefer the warmth that comes from sipping a great bourbon. So with that in mind, with the snow shoveling done and the wind howling, I perused my bourbon cabinet, and decided to try the unique looking bottle of Angel’s Envy. I will admit I had a bit of a grudge against Angel’s Envy. When I first started making myself a nuisance around liquor stores, seeking out new bourbons to try and review, store keeper after store keeper would push Angel’s Envy on me. It started to get obnoxious – I’m looking on the backs of shelves for a forgotten single barrel, a neglected micro distillery bottle or a dusty bottle of Pappy or Stagg, and aggressive sales people kept telling me “try Angel’s Envy.” So I began to rebel against the thought of it, and didn’t pick up a bottle. Well, this Christmas, I received a bottle as a gift, so there was no need to boycott it anymore. So while the gales blew outside, I popped the cork and poured a glass. Angel’s Envy has been on the scene for a couple years, a unique bourbon with two claims to fame – one that it was created by the Master Distiller Lincoln Henderson, the taste buds behind Woodford Reserve’s introduction in the mid-90s, as well as the creation of Gentleman Jack Tennessee Whiskey; and two that it is a bourbon finished in Port Wine ‘pipes’ or barrels. Angel’s Envy hit the shelves in 2011, and didn’t take long to make a big splash. Mr. Henderson passed away this last year, but the spirit he created in Angel’s Envy continues to live on. My take: It has a distinctive bottle and it a sharp looking product. In the glass is is a lighter amber color than most of the bourbons I’ve sampled, more transparent and less thick looking. But my goodness the nose – Angel’s Envy has a fantastic nose. There is a sweetness, like maple syrup and brown sugar. I also noted something reminiscent of raisins. With eyes closed, the sweetness came with each sniff – slight caramel, hints of vanilla. This had one of my favorite noses of all time. After such a spectacular nose, I had a hunch the taste may let me down, and it did, if only a bit. Not that it was bad – far from. It was smooth and there were no unreasonable tastes. Mainly I noted soft corn, a hint of cinnamon and clove, and a very light vanilla. It didn’t burn, and no particular flavor jumped to the forefront. It was a fine, pleasant, and rather thin mouth-feeling bourbon. The finish was long and warm, and only then did you get a hint of the port wine that it was finished in. …Gentleman Jack. It hit me that it’s smooth, tasteful but ultimately safe pour reminded me of Gentleman Jack, the smooth, tasteful but ultimately safe pour Tennessee Whiskey I enjoy when I’m not feeling like a bourbon. The fact that both are recipes from the same man only encouraged this feeling. *there is a cask strength Angel’s Envy, which I am looking to score a bottle of. I have a hunch in a higher proof, I would like this bourbon even more and note certain flavors much more.